is honored on Panel 26E, Line 74 of the Vietnam Veterans Memorial. 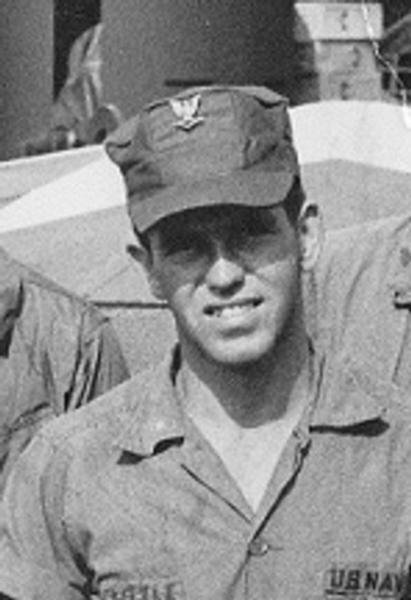 The President of the United States of America takes pride in presenting the Silver Star (Posthumously) to Engineman Second Class [then Engineman Third Class] William Harris Little (NSN: 9199651), United States Navy, for conspicuous gallantry and intrepidity in action on 15 September 1967, during action against communist insurgent (Viet Cong) forces in the Mekong Delta region of the Republic of Vietnam. As the 40-mm mount-trainer aboard Monitor 11-3, a unit of River Assault Flotilla ONE, operating in support of the 2d Brigade, 9th United States Army Infantry Division, Petty Officer Second Class Little participated in a riverine assault against the Viet Cong stronghold in the Cam Son Secret Zone. His unit's task was to provide close covering and neutralizing fire for the embarked army troops. While proceeding up the Rach Ba Rai river toward the designated landing zone, the assault force units were suddenly subjected to withering enemy automatic-weapons, recoilless-rifle, and rocket fire from heavily fortified positions on both banks of the river. Petty Officer Little immediately took the enemy positions under fire and systematically began to silence them, drawing intense counterfire because of his own effectiveness. When an enemy B-40 anti-tank grenade round scored a direct hit on his gun position and put it out of action, Petty Officer Little, despite his wounds, moved into the boat's mortar pit to administer first aid to a more seriously wounded shipmate. He was helping to remove the injured man from the open mortar pit when he, himself, was fatally wounded by another exploding B-40 round. Petty Officer Little's selfless courage and inspiring devotion to duty in the face of severe enemy fire were in keeping with the highest traditions of the United States Naval Service.